It's the goodness of my youth. I think I was in college when they finally got In N Out here in town. It was a good day. Actually...it was an awesome day. The juicy goodness. The all natural ingredients. The bible verse on the cups. The fries...let us all pause for a moment of silence. My husband might, in fact, be their #1 fan. He is filled with joyful glee whenever we go to there...so when we were trying to figure out where to eat on our family day and the boy shouted out "HOW BOUT IN N OUT?" It took only seconds for us to be in the car and on the way to our juicy, cheesy, onion-y, all natural (it makes me feel better to mention it) goodness that awaited us at our In N Out. We were, of course, loud and obnoxious as I anxiously searched for a booth. Why is it that no matter what time of day it is there are exactly one million people at In N Out? See how happy he is? 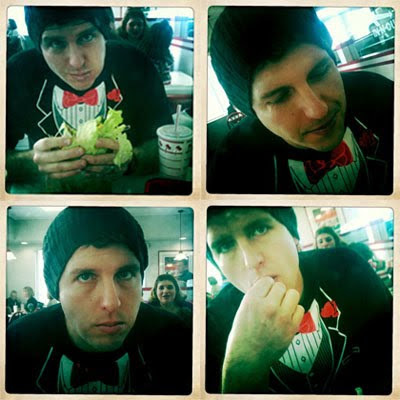 And then he slowly goes into an In N Out coma...it's a happy place...don't worry. You should try it sometime. Baby Z was, of course, an angel. And the boy...well...he's my boy. 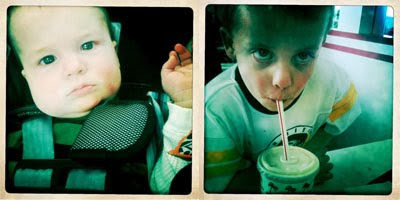 He's fun, and active and loves his milkshakes. How did I get to be the luckiest lady on the planet?